I was really curious when I first saw this promo CD arriving at the Metal Temple headquarters for a review. I knew neither the band nor the label that released this album. The publishing director assigned this review to me since he thought I was the appropriate person. I guess he was right since BOBAFLEX's modern approach to the Metal sound is really interesting and I am really glad I have this CD in my hands! The US based metallers BOBAFLEX have been active since 1998, when they released their debut album Primitive Epic, which featured a sci-fi concept. They have managed to share the stage with well-known acts like DISTURBED, MUDVAYNE and NICKELBACK and have played in MEGADETH's Gigantour, too. The above-mentioned bands are probably some of the bands that have influenced BOBAFLEX's music. The band's sound is rather experimental and features many different elements that range from Hard Rock to Nu Metal. We can say that they belong to the same category with bands like NONPOINT, MUSHROOMHEAD and 40 BELOW SUMMER and SEVENDUST. Their music is mostly based on groove and melodic breaks that are accompanied by melodic yet raw vocals. From what I found on the internet, I saw that BOBAFLEX have already established their own loyal fanbase and have managed to define a unique sound. Tales From Dirt Town is a bit heavier than the band's - two - previous albums, but it still carries this special BOBAFLEX feel. The production is really incredible and adds a lot of heaviness to the band's sound. The cover is also pretty good and a bit mysterious may I say. 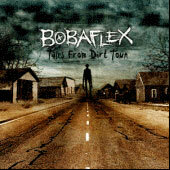 If you want something different and fresh that will remind you of bands like KORN or SEVENDUST, BOBAFLEX is definitely the best choice for you. This album really deserves your money, if you like this kind of music of course.